XeroFlor's green roof options include a range of lightweight systems weighing only 8-10 pounds per square foot to ballast applications of 25 pounds per square foot. Our green roof assemblies can be used in basic flat roof applications as well as more dynamic roof structures - even on slopes up to 45 degrees. The flexibility of our systems means that we can customize to suit your project, whether it's a retrofit with a steep slope or new construction of any type. 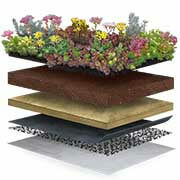 Below is our library of design details for all your green roof design needs. If you have any design questions, chat with one of our friendly design experts. We also have CAD files available upon request.